You'll be £14.99 closer to your next £10.00 credit when you purchase A Dictionary of Family History. What's this? Part encyclopedia, part dictionary, part almanac Jonathan Scotts Dictionary of Family History doesnt claim to be exhaustive, but it is practical, easy to use, entertaining and genuinely informative. It is the kind of book you can dip into or use as a starting point for deeper study, and it is the essential companion for experienced family historians and for anyone who is approaching this fascinating subject for the first time. Thousands of A to Z entries are full of intriguing facts. There are definitions, timelines and terminologies, details of archives and websites as well as advice on research methods and explanations of genealogical peculiarities and puzzles that would test the knowledge of even veteran researchers. Longer entries explaining the mechanics of the first census and other major sources and records rub shoulders with simple one-line definitions of obscure terms, useful addresses and signposts to little-known but rewarding corners of family, local and social history. This concise, clear and wide-ranging compendium of helpful, sometimes surprising information is a valuable reference tool for everyone in the field. This is a wide-ranging guide to information relating to family history with a simple alphabetical arrangement of entries, varying from a sentence to a page in length. In his introduction, the author states: “my approach may seem random at times”, covering “facts, dates, tips, advice, websites and little known sources”. His motivation for inclusion of an item is, “if I found it interesting or useful, hopefully someone else would too”. Overall this is a useful source based on personal experience and enthusiasm. fascinating subject for the first time. reference tool for everyone in the field. a valuable companion especially for the beginner to use as a basis for further study. It will also be of use to social and local historians. You may think that internet search engines have replaced such reference works as this but relevant search terms may not come to mind. Jonathan Scott is a freelance writer specializing in family history. He writes columns for ‘Who do you think you are?’ magazine and has written a number of books on family history. This recent edition is a genealogists’ ABC. It is the kind of book you can dip into being part encyclopaedia, part dictionary and part almanac. I found myself skimming at first but I began to realise that there was much that was interesting and often amusing. An example is the obscure definition of ‘loblolly boy’ who was an assistant to a warship’s surgeon! This book will be of great use not only for the beginner but also for the experienced family history researcher. There are definitions, timelines and terminologies, details of websites and archives as well as advice on research methods and explanations of peculiar terms like the one shown above. I have made a note of a number of websites for my own research that I hadn’t thought of before. A couple of examples are: opendomesday.org This is a free online copy of the Domesday Book in which you can explore entries by county. Then there is: castlegarden.org being the main processing centre for immigration to USA with millions of records from 1820 to 1892. This is a clear, concise and wide ranging book and one that should inform as well as entertain the reader. 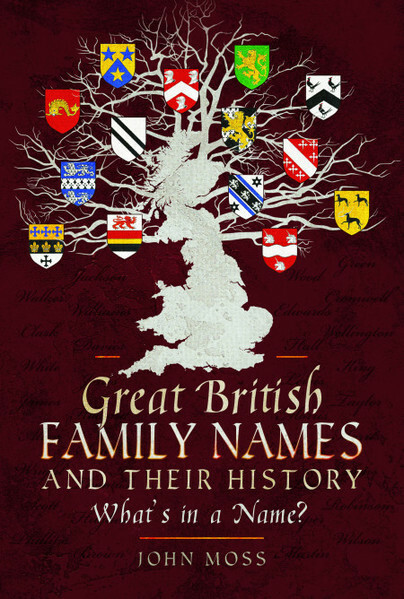 The author does not presume to have written a definitive dictionary of family history but there is a wealth of detail provided that will certainly keep family historians happy. One problem with books like this is they require regular updating; the website addresses provided, for example, may only have a certain shelf-life. But as long as Scott is willing to revise this book as necessary, it will continue to be of use to the family historian for some time to come. This information and amusing approach to genealogy provides a practical guide for individuals seeking an introduction to the field and those pursuing deeper study. Jonathan Scott navigates the complexities of genealogy in an easy and engaging style, providing the reader with a wealth of practical knowledge. The information spans from instruction on accessing archived websites to insights on how to tackle complications like facing gaps within consensus and offering advice on tracking down probate records. The author's understanding of his subject is evident and he compiled a helpful list of further resources for his readers. Definitions include unusual terms that emerge when delving through old records, particularly in regards to careers such a 'loblolly boy' (a warship surgeon's assistant) and 'printer's devil' (a printing apprentice). A particularly remarkable aspect of this title is the vast subject knowledge that spans far beyond genealogy. Scott provides an extensive overview of the field from cultural, social and legislative perspectives, including information about matrimonial law, crime and punishment and taxation documentations. This allows a much more comprehensive understanding of what databases are available to research within, as well as an insight into the wide variety of routes one can take when investigating family history. 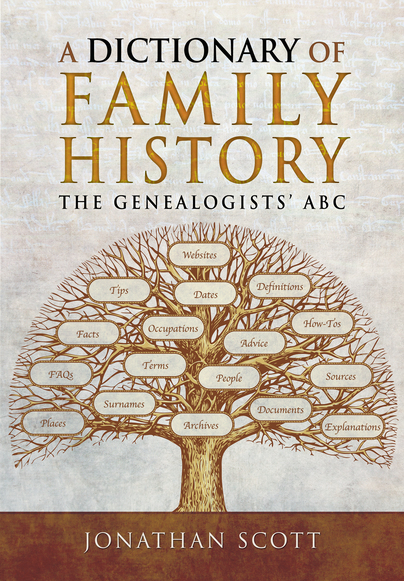 A very helpful and more personal approach to genealogy, this title is a valuable addition to the bookshelf for any individual seeking to add more than just names to their family tree and instead find themselves keen on uncovering the social history of the time. A practical, easy to use, informative and entertaining book which is part encyclopedia, part dictionary and part almanac. ... If you don't want to reply on Google, Wikipedia and the like for your information, this is undoubtedly a worthy addition to the bookshelf. WDYTYA? Magazine, May 2017 - reviewed by Paul Blake. There are many terms and terminologies to be encountered whilst researching your ancestors - this book lists them all and explains their usage and meaning - again, an essential addition to your genealogy library. This is exactly as it says, a dictionary. However, it covers a bit more than a normal dictionary would. In some of the entries there are tips and clues of how to navigate the looked up entry. For example, if you look up German Lutheran Church, it gives a description and then steps outlines on how to go about your search. Some entries have this and some don't. It also addresses a lot of historical colloquialisms. What the heck is a fish-fag or a moonraker? This is great for someone first starting out looking for Ancestors in the United Kingdom that does not live there. The preface states "this book is part encyclopedia, part dictionary, part almanac, part directory", and continues "The idea was to create a work of reference where definitions of obsolete terms rubbed shoulders with facts, dates, tips, advice, websites and little-known sources." If this gives you the impression that the book is a bit of hotch-potch then you're right - it isn't by any means comprehensive, and yet every time I opened the book at random I came across something useful or interesting that I didn't know before. A really interesting book, full of lots of useful tips.